The first identified compact galaxy group, Stephan's Quintet is featured in this eye-catching image constructed with data drawn from the extensive Hubble Legacy Archive. About 300 million light-years away, only four galaxies of the group are actually locked in a cosmic dance of repeated close encounters. Explore a beautiful and complex region of nebulae strewn along the plane of our Milky Way Galaxy in this widefield skyscape. 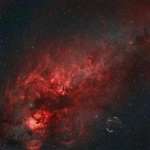 The image emphasizes cosmic gas clouds in a 25 by 25 degree view centered on the Northern Cross, the famous asterism in the constellation Cygnus. Hurtling through a cosmic dust cloud some 400 light-years away, the lovely Pleiades or Seven Sisters star cluster is well-known for its striking blue reflection nebulae. In the dusty sky toward the constellation Taurus and the Orion Arm of our Milky Way Galaxy, this remarkable image shows the famous star cluster at the upper left. Sometimes, you can put some night sky in your art. Captured above Japan earlier this month, a picturesque night sky was photographed behind a picturesque frosted leaf. The reflecting ice crystals on the leaf coolly mimic the shining stars far in the background. Is this what will become of our Milky Way Galaxy? Perhaps if we collide with the Andromeda Galaxy in a few billion years, it might. Pictured above is NGC 7252, a jumble of stars created by a huge collision between two large galaxies. There's no place like home. Peering out of the windows of the International Space Station (ISS), astronaut Tracy Caldwell Dyson takes in the planet on which we were all born, and to which she would soon return. Do nearly exact copies of you exist in other universes? If one or more of the multiverse hypotheses is correct, then quite possibly they do. In the above computer-enhanced illustration, independent universes are shown as independent circles or spheres. Spheres may be causally disconnected from all other spheres, meaning no communications can pass between them. Big beautiful spiral galaxy M66 lies a mere 35 million light-years away. About 100 thousand light-years across, the gorgeous island universe is well known to astronomers as a member of the Leo Triplet of galaxies. Like delicate cosmic petals, these clouds of interstellar dust and gas have blossomed 1,300 light-years away in the fertile star fields of the constellation Cepheus. Sometimes called the Iris Nebula and dutifully cataloged as NGC 7023, this is not the only nebula in the sky to evoke the imagery of flowers.